"An easy pumpkin roll dessert that tastes great." Preheat oven to 375 degrees F (190 degrees C). Butter or grease one 10x15 inch jelly roll pan. In a mixing bowl, blend together the eggs, sugar, cinnamon, and pumpkin. In a separate bowl, mix together flour and baking soda. Add to pumpkin mixture and blend until smooth. Evenly spread the mixture over the prepared jelly roll pan. Prepare the frosting by blending together the butter, cream cheese, confectioners sugar, and vanilla. When cake is completely cooled, unroll and spread with cream cheese filling. Roll up again without towel. Wrap with plastic wrap and refrigerate until ready to serve. Sprinkle top with confectioners sugar and slice into 8-10 servings. 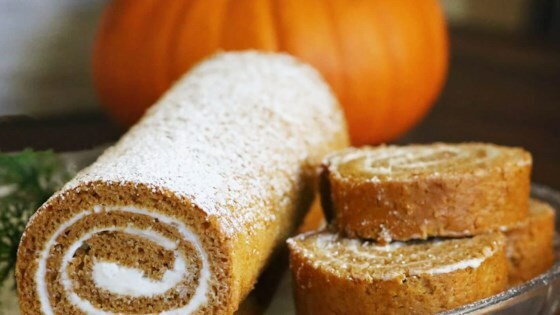 Watch and learn how to make a holiday-favorite Pumpkin Roll Cake. Delicious but my cake fell apart when i rolled it up. Any ideas what i'm doing wrong? I was a little afraid to try this recipe because of the whole rolling up a cake thing. However, it turned out very, very nice and not too hard at all. Thank you! I made this using a 17 1/4 x 11 1/2 jelly roll pan. The roll was a little smaller and longer. Very moist and very tasty.